Estimated Minimum Steam Sales as of December 3rd. Last edited by EricB on Tue Jan 24, 2017 4:39 pm, edited 3 times in total. I may or may not make a line chart with all the games for the year sometime this month IF I have time. So what's new? Scrap Mechanic officially switch to their own engine on December 19th. As such we will no longer be updating it's numbers on our chart, We have frozen the values for the week before the 19th. Since that's the last time the Ogre version of the game was sold. Rebel Galaxy, Running with Rifles , and Zombie Driver all saw nice little bounces with the Winter Sale. Not all the numbers for the sale are accounted for in this month's numbers, but none the less, quite a nice month for these games. Rebel Galaxy in particular should break the 300,000 owners mark (it probably has already) by next update. Free to Play game DRAKERZ jumped over Zero Gear for 15th. However I don't believe it's much of an achievement for F2P to jump over pay for games since it's much more difficult for pay for games to get "owners." One wonders how much of the pie can be sliced before those on the lower end start to fail. Of course, barriers to entry haven't ever been lower, so I don't for see the saturation ending anytime soon. > One wonders how much of the pie can be sliced before those on the lower end start to fail. are there any quality metrics about this huge influx of games in the market? i.e. is the market being saturated with high quality games? or is it a spread similar to what the store had in the past? 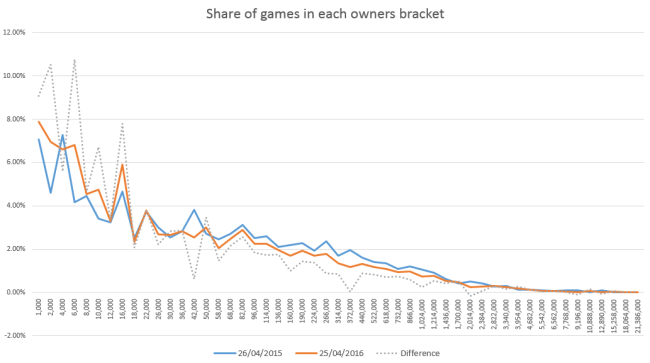 is the market growing, or is the pie staying the same but being cut by more and more games? also - what are your thoughts about a smaller store but with less saturation like the windows 10 store via desktop bridge. (i.e. you can now bring your classic win32 games into the windows store without changing your code. as always, thanks for your analysis! loath wrote: > are there any quality metrics about this huge influx of games in the market? i.e. is the market being saturated with high quality games? or is it a spread similar to what the store had in the past? In that, it shows that 1) More games out there, 2) Declining units shipped in that 24 day period. 3) Declining estimated price copy. 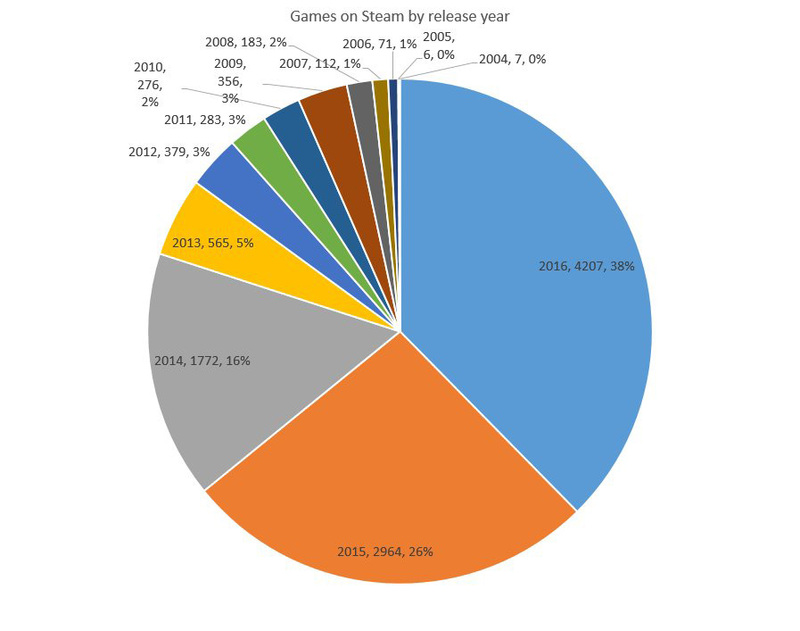 He also released a nice graph here: http://cdn.mos.cms.futurecdn.net/qFaqtK ... 650-80.png showing that there are now more games as a percentage with <22,000 sales than there are with more than that. The steam spy guy also a nice overview of 2016 on his blog: https://galyonk.in/steam-sales-in-2016- ... .bz6zcogke in there you'll find that the median revenues for a game on Steam is down to $25,000/year. And that Steam as a whole has roughly $3.5Billion in revenue, in line with what he predicted Steam's revenues to be in 2015. Assuming his predictions are correct, Steam is flat with sales, but has more games released. Which is inline with the first picture I linked. Digital Video game sales as a whole are supposedly up by around 10% in 2016 according to a number of sources. However most of this is not on Steam. As most of the "big" games this year are not attached to steam. Think Battlefields, Overwatch, LOL, Wow, etc. Brings me to GC. I haven't crunched our numbers fiscally for the year, but off the top of my head, we saw about a 35% decline in revenue 2016 vs 2015, despite our review score going from 72% to 80% (And the fact we're still in Early Access which means frequently improved and updated...) This is roughly in line with the number of games added to Steam this year. How much of that is saturation and how much of that decline is age? Well, GC's 2015 H1 did better than 2014's H2, and that was a launch half... So I don't think the full 35% decline is purely age related. I've read some private forum post of folks who've released games on Steam in 2012 and made bank and then released ~better~ games in 2016 and flopped pretty hard. That's a bit anecdotal, but Steam (or enough developers) think visibility is big enough issue that they're reworking their store front stuff pretty frequently now. My personal thoughts is that you want to put your product in as many store fronts as possible for the least amount of costs (time/money). Unless you're being paid for exclusive licenses. For instance, GC is still in development, so it wouldn't make sense for me to spread it outside of Steam at the moment (for management/support reasons). But I do know the "App Store" on OSX only takes 64-bit Cocoa programs now. GC uses Carbon and OIS (which is 32bit only on OSX). I probably wouldn't make back the time invested into porting the game to cocoa/sdl/64bit on the App Store, so i'll by pass it. Whereas GOG, if they accept the game, is just an installer. Low barrier of entry, no excuse not to launch the game on there. 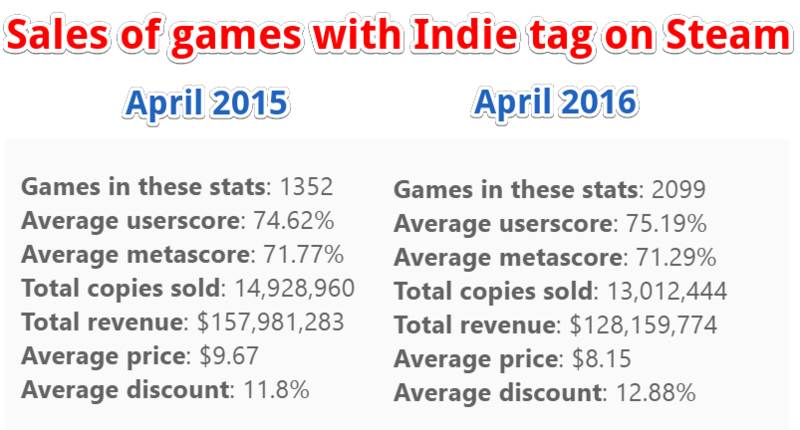 So if porting your game to Windows 10 will get you more sales than the time it takes to do it, go ahead and do it! a friend posted this engineering blog from riot (https://engineering.riotgames.com/news/ ... s-pipeline) and they still use directx9. 10 million league games played per month on XP. i immediately thought of your post. i had not considered so many players were still on xp. >Whereas GOG, if they accept the game, is just an installer. getting gearcity onto the win10 store (via the "desktop bridge") essentially requires you to package your existing binaries into a zip file (called ".appx") with an xml manifest. i.e. the process takes 30min or less. i also hear they are not taking a percentage for the next 1-2 years but i have not confirmed this. Here are some charts I promised. Starting in March, I moved to rounding the owners figures on Steam Spy's page so that we don't have wild scattering charts all over the place. Spacing out the rounding values to nullify the margin of error somewhat in their calculations. And to give a better idea of the ~minimum~ number of owners on Steam. As you can tell, Ogre is dominated by Torchlight. And will probably be so for quite a long time. Scrap Mechanic did rather well until they were delisted from our chart for engine change. Free to paying Victory Age of Racing, while probably not very profitable did bring a lot of new users to the game. I don't believe it brought too many users to Race Craft however. As it's still in the bulk of lines at the bottom. As you can see, there are a lot of flat lines. The bottom half of Ogre based games moved very few units (not enough to get to the next rounding peg anyway) over the year. Outside of the growth of Scrap and Victory. Rebel Galaxy had a strong second half, And Running With Rifles had nice constant growth throughout the year. There are a number of games that look like they spiked on this chart, such as Alchemy Mysteries, but this is mainly because I found these Older titles and did not have access to the older data for these games. Last edited by EricB on Tue Jan 24, 2017 2:32 am, edited 2 times in total. Not including F2P, Scrap Mechanic, and any older games I found during these months, the movement was around 780,000 copies. loath wrote: a friend posted this engineering blog from riot (https://engineering.riotgames.com/news/ ... s-pipeline) and they still use directx9. 10 million league games played per month on XP. i immediately thought of your post. i had not considered so many players were still on xp. *I did purchase a Windows 8 tablet and a Windows 8 laptop. The former only really used for ebooks, the later rarely used except when I need to work portable. I don't use it enough to convert it to a Unix OS though. Plus it's good to test once in a while in the newer windows since it's ~80% of my target audience. As to comments on that blog post about targeting Windows XP. Personally I believe if you're limited to DX9, such as the case with Ogre 1.x, then you have no reason not to support XP. Off the top of my head I can't think of any API calls that are in modern Windows that do not have an XP equivalent or work around. I've seen some games, such as the Ghost in the Shell FPS released about a year ago have a DX9 engine but their login/anti-cheat client only supports Win7+. Quick glance at my stats, I've had 125 unique Windows 5.2 players this month. (Including Pirates.) Or 1.5% of the player base. That roughly represents around 125 * $8 = $1000 worth of sales for practically no work other than using API calls that work (when OS specific code is needed.) To give you another comparison, I've had only 170 unique Linux users this month. So in summary, if your using DX9, you have no excuse not to port to XP. If you're using OpenGL, you have no excuse not to port to XP, Linux, OSX, hell, throw us FreeBSD guys a bone sometime too! Theoretically my publisher should be handling all that when I release my final build. But I'll keep it in mind otherwise. I retroactively added Void Destroyer 2 and Sunset Rangers to all the charts since luckily enough I had enough data that we didn't miss anything. They won't be included in 2016's graphs I already made. SteamDB did not have a file list for http://store.steampowered.com/app/364510 So I can not confirm or deny that this is an Ogre game. If anyone finds any information, it would be helpful. Estimated Minimum Steam Sales as of January 3rd. ouch! had high expectations for this game. What's wrong with it? If you scroll to the post above that, you'll see my thoughts on the subject. I just updated the original post with Feb numbers. They're up to 800 now. Will probably break 1000 for March 1st's I would imagine. Sorry for the delay, I had a huge patch for the 10th of this month and was falling a bit behind. Quite a few things broke, so I had no time to really do the list. No worries though, because I can see the last 3 months worth of data. From the looks of it. Many games in the upper 100k range saw an increase in sales, although no position changes. Torchlight II was pretty close to breaking into 3.4m range, it should be there next month. Rebel Galaxy broke the 300k mark. Zombie Driver hit 200k, Dungeons- The Dark Lord jumped to 170k , Zero Gear increased to 120k units. Outside of the 100k+ games, there wasn't much in terms of sales growth. Shadows: Heretic Kingdoms increased it self to 30k, Emergency 2017 hit 9k and will probably break 10k next month. The only movement in the charts this month is Void Destroyer 2 topping BOMB for 57th position with 3000 units. This is a bit of an anomaly however since we know that Bomb probably has sold 3000 units, but due to statistics and rounding it only appears as 2000 on our charts. (Crashy gave us exact numbers of 2506 roughly one year ago.) Anyhoo both statistics and rounding rules apply to both games, so VD2 has certainly sold more. Finally, taking up the rear of the chart is Sunset Rangers, it jumped up to 800 units by Feb. 1st. Hopefully this removes some of the saturation in the store now. Ogre based games will probably not be effected much, as most of the problems are with asset flipped unity games, or game maker games, etc. We'll see how it goes. EricB wrote: Rebel Galaxy is the big mover. 50,000 new owners are being reported. It jumps 3 spots into 6th with 250,000 units and is trending to pass Damned next month. I haven't investigated why such a movement yet. Estimated Minimum Steam Sales as of February 1st. So What happened in February and first half of March? Not much. Running With Rifles was able to jump up to the next rounding level. Emergency 2017 was able to jump over Ankh for 52nd. I did notice some late movements in the Month of March for Void Destroyer and April(or may) for Zombie Driver. But that data won't make it into the charts until the Mid June chart. In short, game was allegedly stolen from the lead developer by a partner, the assets reused in other games. Sickbrick's main dev has started legal movement (at least take down requests it seems) against "Maxwolf" which is why Sickbrick is no longer on Steam... Kiddos, make sure anyone who works on your game signs a legally enforceable contracts, and you retain all control of the administrative systems on Steam... Don't give that away to a contractor. (Publishers are a different story.) Anyone who does work on your game for free, make sure they CC0 or CC-BY or CC-BY-SA all their work and properly document it. Be safe, anyone can sue you for anything at anytime. Good way to nab a cheap copy of one of the most owned Ogre based games. Only a month late with this chart, I might throw some graphs together as well in the next couple of days. From the looks of it, moving to quarterly reporting was a good idea, as there is actual movement on our chart! Tourchlight II remains the most "Owned" Ogre3d based game on Steam that we know of. They finally reached the point where they safely can be moved up to 3.4million owners. Although remember, there was a couple free to play weekends for T2, which skews the numbers. Victory Age of Racing saw an increase in the amount of players. The free to play game was able to jump to the next level on our charts with 400,000 owners on Steam. While Rebel Galaxy didn't move any positions on the charts, they were able to jump up 3 more rounding positions on the chart from 300,000 owners to 375,000 owners. Zombie Driver is our first movement on the charts this quarter. I assume the gains were mainly from the sub $1, 90% off sales they had, as well an accumulation of previous sales (remember they have to gain 25k owners before being rounded up). Zombie Driver jumps over The Book of Unwritten Tales and DUNGEONS - Steam Special Edition for 8th place. Void Destroyer jumps a whopping 21 places as it was included in the Humble Jumbo 8 Bundle. They've increased ownership by around 55,000 owners to 80,000. This pushes Void Destroyer from 41st to 20th on the charts. Remember however, bundle sales are normally pennies on the dollar, but impressive none the less. Battlezone 98 Redux reaches the next rounding mark at 25,000 owners. This moves it from 45th to 42nd over Ankh 2 and Kromaia. Battlezone keeps slowly creeping up the charts. The latest version of Emergency, Emergency 2017 has reached the next rounding spot as well with 15,000 owners. This moves it ahead of 4 games Hotel, Masterspace, I Shall Remain, and The Body Changer into 48th spot. Finally Void Destroyer 2 has gained another 1000 owners for 4,000 which is good for 56th, surpassing Stained. I would imagine many of these sales are coming over from the bundles. While doing my charts, I ran against an interesting tidbit. 9HEADS makers of Vitrum, Damned, and Sunset Rangers on our charts has had a schism. I'm not sure why or what is the cause but it seems that 9Heads has split from Aymar Fisherman. Fisherman is now listed as developer and publisher of Sunset Rangers. So one would assume he retains control of Sunset Rangers IP, while 9Heads will continue on with the other 2 games and whatever they plan on working on next. I can only imagine this was due to the lack of success Sunset Rangers has had. The sales have been so low that SteamSpy can't generate accurate numbers. Using my own paper calculations (Reviews * (30 to 100 depending on review score)) It's not more than 1500 units. That kind of disappointment surely put stress on their development. Maybe Fisherman, if he's active on here can shed some light on it. In closing, next quarter I may adjust how I calculated the numbers. Instead of eyeballing how many days a game is above a rounding number, I will use the average of 2 of the highest and 2 of the lowest days, then check against the rounding spots. Should be quicker and a bit more "fair" rather than me curating the values generated by Steam Spy, and make the sub 30,000 unit games a little more accurate. More than half of the Humble Bundle "sales" are actually - 0 on the dollar - literally giving away copies. The info is known ahead of time so its not a surprise, everything is on the up and up in terms of communication from Humble. It did seem like it boosted part 2's sales - which was my main hope with a ok-ish paycheck for a "old" game. It also flooded the "key reseller" sites - before it was pretty rare for Void Destroyer to be on them as I almost never had big discounts. As far as VD1 and VD2 performance - comparing early access launches - it is a factor of 1/5th the sales. Pretty brutal! Void Destroyer early access was featured on Steam's front page for a week-ish (on and off - in various places with various prominence) while VD2's early access made it to Steam's "Early Access" section for a day or two then got bumped off.